Even though English is a universal language, there are still over 6000 languages written and spoken in daily life right across the world. Chinese is the most popular language spoken after languages such as Spanish, English, Hindi and Arabic. A multilingual website helps to increase your global reach and it’s something every developer and website owner should consider. WordPress is one of the best platforms when it comes to setting up a website and it’s available for everyone irrespective of their mother tongue. You can find out more about installing WordPress in your chosen language here. WordPress also has a range of exciting plugins to handle and create multilingual content for your website visitors. These plugins help you to extend your site to be more accessible and to avoid losing potential site visits simply because the visitor may speak another language. Why Should You Add Multiple Languages on Your Website? Even though English is a universal language, only 26% of the total online audience are native English speakers. This figure is even lower than previous years and it’s set to fall more. In the US, which is largely an English-speaking country, up to 10% of the population speaks Spanish. Multilingual countries are common. Ensuring your website is multilingual not only helps to increase your global reach but also provides a platform for increasing sales. For instance, ASOS, which is a European clothes brand, enhanced their sales by 39% across the world, when they increased their reach to include the Chinese and Russian markets in 2013. In this article, I’ll cover the key features and benefits of some of the top WordPress plugins designed to help your website better cater for multi-language. 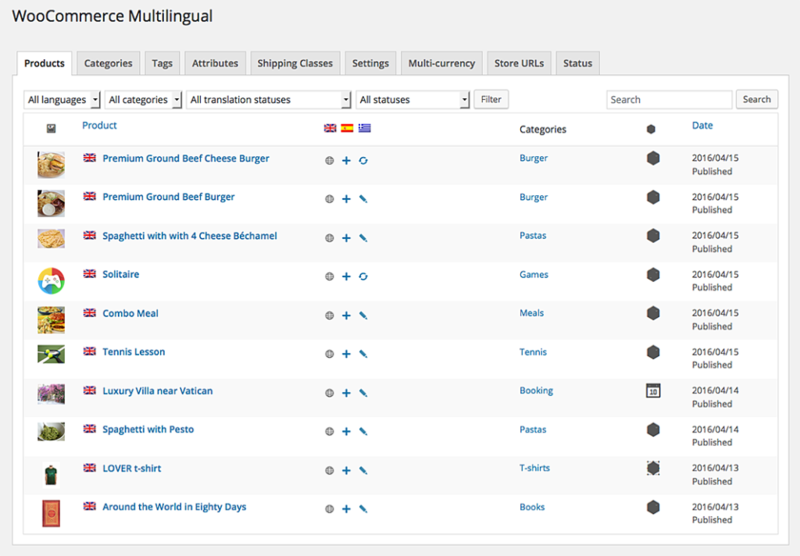 This is a full featured plugin that manages both translation and multilingual functionality. It comes in different licenses to suit almost any WordPress website – Multilingual CMS ($79 per year), Multilingual Blog ($29 per year), and lifetime option ($195 once off). Naturally, the blog option is aimed towards less complex needs and sites and can handle all kinds of multilingual posts, along with menus and taxonomies. It can also detect language of browsers. All these features are added in CMS along with the ability to translate widgets, custom feeds and themes. It also offers multi-user translation management and ecommerce support. Supports unlimited sites and 30 day money back guarantee with any of the above versions. Provides out-of-the-box support and is compatible with many themes for up to 40 languages. Fully developed platform within the CMS to manage content and assign jobs to translators. You can connect your WPML install to various pro translation services in order to outsource work and enable various levels of management screens and notifications to keep track on your site progress. Active development team to provide dedicated support in different languages and active community forums. Google Language Translator is a plugin not officially from Google, but it’s built on the top of official translation tool, Google Translate. It allows you to add a shortcode into pages, posts, or widget areas that need to be translated automatically. It’s been designed to allow you to provide content in multiple languages in the easiest way possible. All you need to do is download and activate plugin, unlike other plugin options. Supports up to 80 languages through Google Translate. You may turn off Google branding when needed. Switch between the whole range of options in Google Translate and a selected range of languages manually. Vertical or inline layout options to provide the best visual appeal. Auto translation to hire pro translator or to translate content manually. 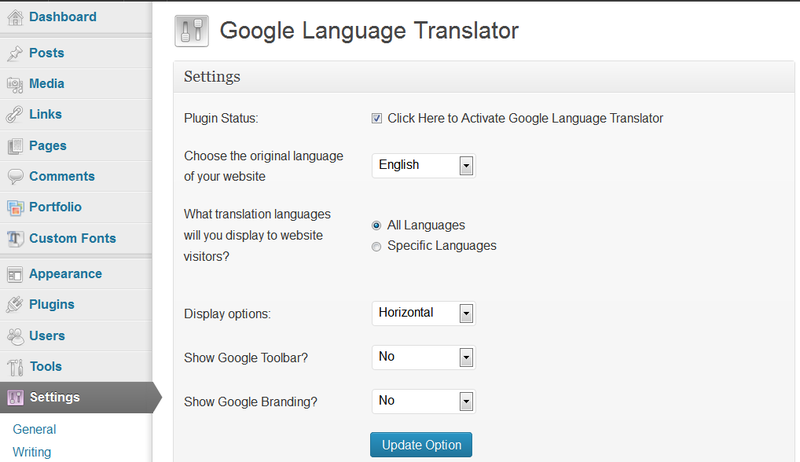 Google Language Translator is a great choice for quick and cost-effective translation solution. It still gets the job done despite some drawbacks in using automatic translation. This is a free and lesser known multilingual plugin offering unique way for visitors to access translated content. With the help of the translation button, Translator is used to translate your site in several languages efficiently and quickly. It’s based on machine-powered, automatic translations through Google Translate. Simply choose the desired language to add for the viewers. Automatic translation option above each post. With best Google multilingual practices, it’s SEO optimized. Stylish button customized to match your website’s look. 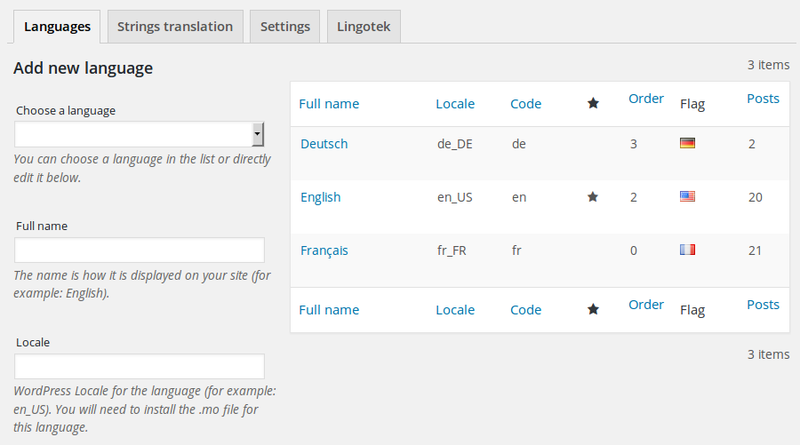 This is a free WordPress Plugin, to translate the theme to multilingual content using WordPress. It supports endless languages that can be modified, added or deleted through an easy configuration page. All you have to do is activate the plugin and write content. It’s the easiest plugin to maintain dynamic content on the site. When the static localization is implemented well and offered with WordPress framework using po/mo file framefork, you cannot maintain dynamic content without having an specialized plugin. Translate widget titles and various custom fields using a shortcode. Automatic date and time format conversion. One language for each URL and three different URL formats available. Language-specific sitemaps for Yoast SEO and Google XML Sitemaps. For multilingual WordPress sites, WPGlobus includes additional add-ons like WPGlobus for TinyMCE, WP Globus for WPBakery Visual Composer (which provides the core plugin on themes supporting WPBakery), WooCommerce and WPGlobus Plus. Tools to translate all kinds of widgets and posts for your website. Allows you to add languages to your website and adds SEO features automatically for translated content. 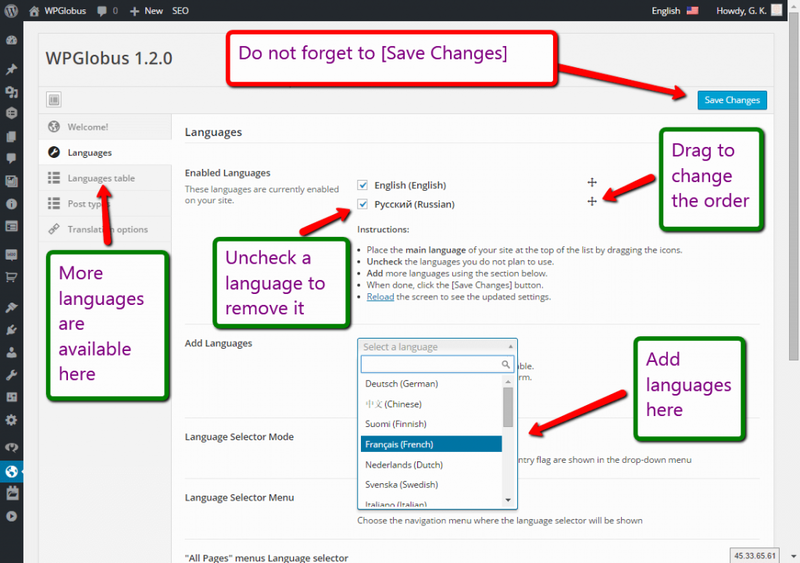 Switch between languages for any post, either through widget or drop-down menu. 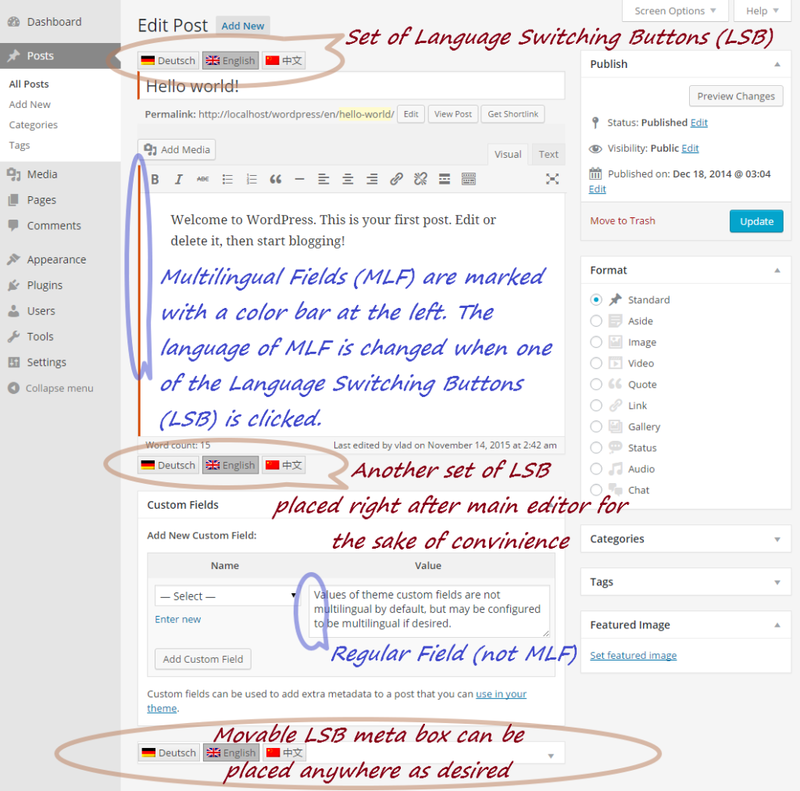 Allow users to switch between languages when available for any post either through widget or drop-down menu. Easy to switch the language of administrator interface according to your preferences just from the dashboard. Features admin interface to translate pages, posts, widgets, menus, tags and categories to several languages. In the navigation menu, it adds a dropdown menu to switch between languages. Admin interface to define custom combinations of language abbreviation and country flag and to select active languages. 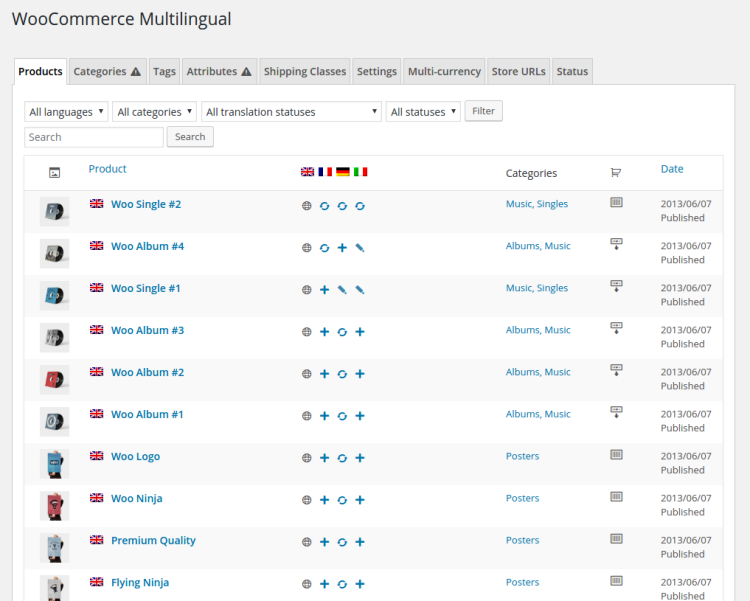 Run multilingual ecommerce sites with ease using WPML and Woocommerce. Visitors can switch languages, translate store pages and products and order your products in their own language. Multilingual with various kinds of product categories. Central management to translate product categories, custom attributes and tags. Keeps the same language throughout the checkout process. Synchronize product images and variations. Enable inventory tracking without having to separate products in different languages. Send emails to administrators and clients in their desired language. Run an individual WooCommerce store with several currencies. If you’re looking for all-inclusive solution to setup and manage a multilingual WordPress site, Polylang provides a well-rounded solution. You can also link the translation service of Lingotek to your add-on. You can also use translation services or perform this manually. Support for over 41 languages using admin interface. Use unique sub-domains for each language enabled. Easily switch between languages with a widget. Even though it can detect the language automatically, one can also set it up manually or with a code in URL. Provides translation features for custom posts, regular posts, taxonomies, and widgets. Should You Choose Professional Translation? Professional translation really is the best option if you’re making money from your site already, to help potentially cover the costs. Standard translation rates can definitely help you to get the feel for what you’ll need to budget. If you choose the professional route, keep in mind that it’s not as simple as just paying someone to care for the translation, setting up the plugin, pasting it in and just leaving it as it is. First of all, it’s a complex task to manage a translation project and you will have to go through sensible guidelines when it comes to sourcing a professional. Capturing new customers or readers from different locations will also require a certain level of support. Before you invest in translation services, consider whether it’ll be viable for your company to engage with these new visitors and customer base. You might need to also review getting some extended support. Do you still think translation of your site is tough job even after reading the above points? Don’t worry! All you need to start small, even with just one alternative language first. Any of these plugins will definitely help you stand out of the crowd. What are your favorite multilingual plugins? Do you have any recommendations for other developers and website owners who are contemplating implementing multi-language functionality? If so, please share your comments below. Jason is a renowned WordPress development professional who works with WordSuccor Ltd. He is a passionate blogger who loves to write and share everything about WordPress and new web design technologies.